For guys who are a lot more classic and conservative with their style, the warmer seasons are a great opportunity to inject a little more color, pattern, and just plain excitement into your look. 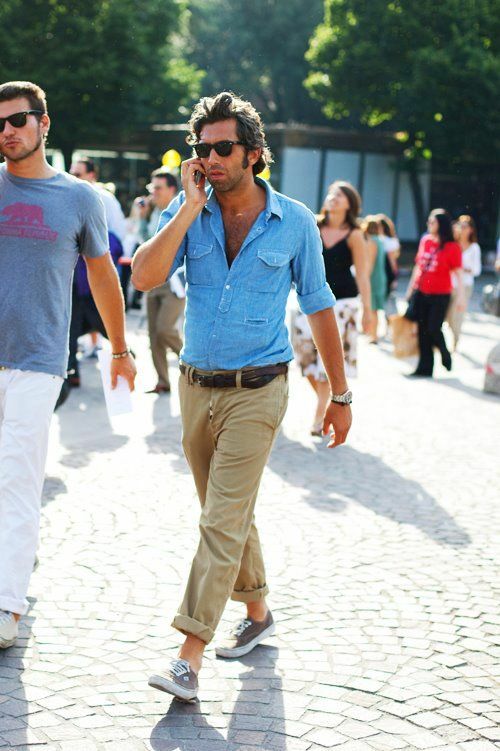 Venturing out of your style can be tricky, especially if you’re the kind of guy that usually sticks to darker neutrals. I developed this trick I teach all my styling clients to help them tweak their style, from adding more colors, trying out a trend, or learning how to put a riff on an outfit they love. I’m going to show you it today. It’s called “The Swap Trick”. Start with a solid, neutral outfit. 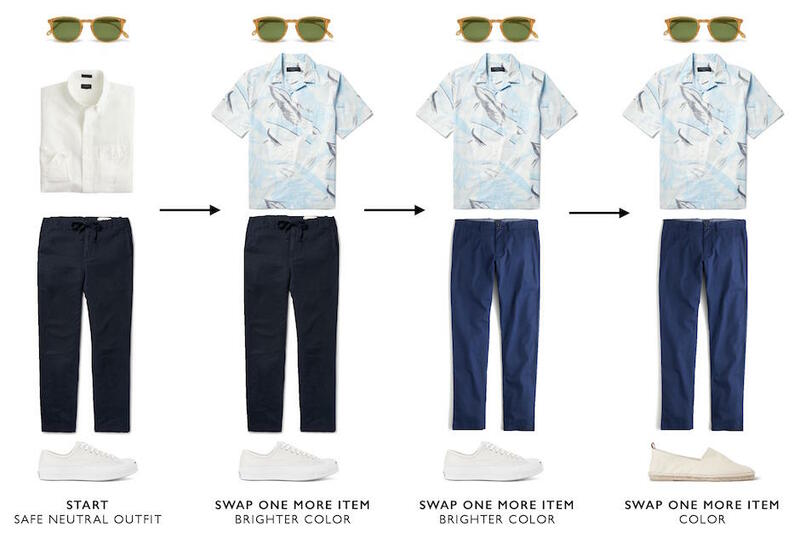 Pick one thing in that outfit, say the shirt, and swap it out for a shirt that’s colored or patterned. 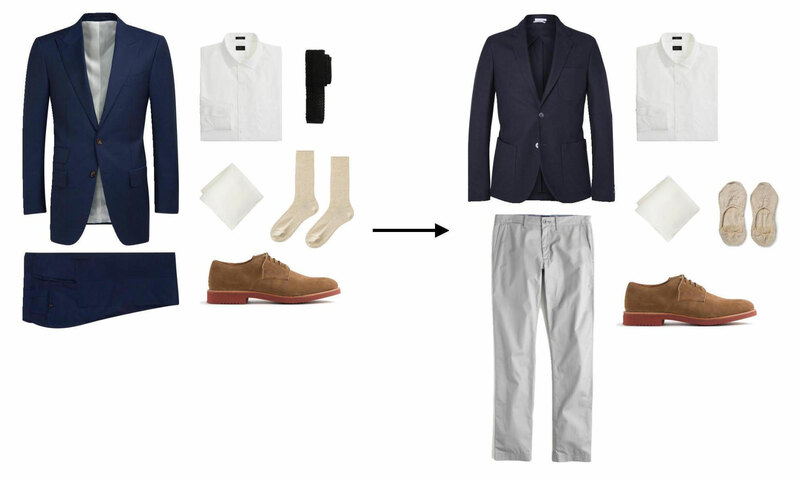 In this example, we start with a neutral colored, relatively safe outfit. It works, but can feel a little boring. So we swap out the shirt for something a bit more colorful. 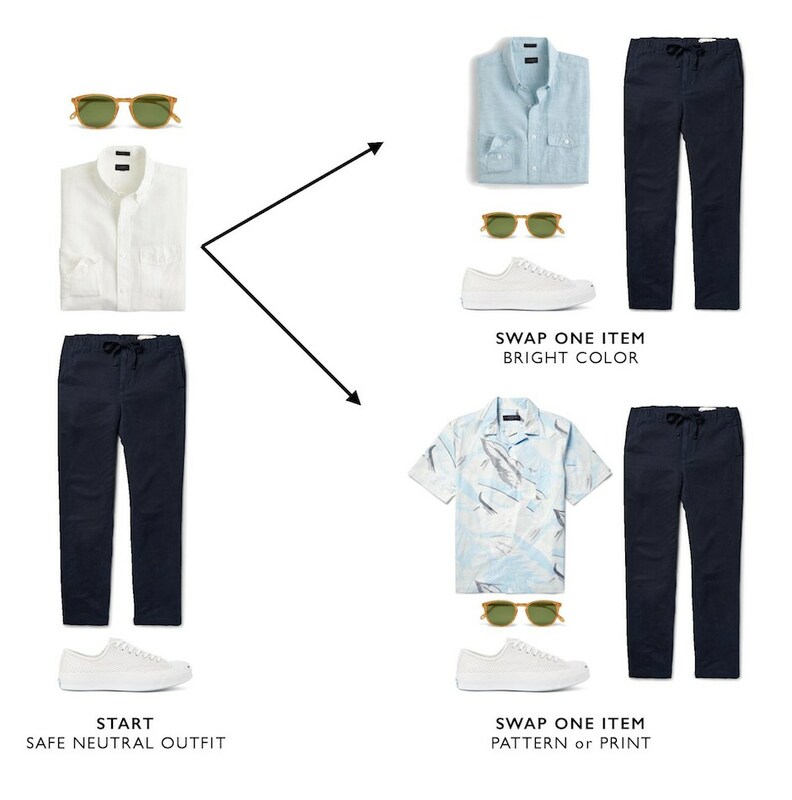 As you can see, we can go two ways – either a solid pale blue button-up, or a printed shirt. Even though these two swaps are relatively small, you can already see how much more colorful and bright the new outfits look. This is a great example of how you don’t need to wear bright colors like orange or pink to look colorful. The goal here is not to overdo it. Let your neutral outfit be the perfect backdrop to something more colorful or patterned. I always recommend you make one swap at a time when you’re starting out. As you get more comfortable, you can keep going. Look at this example, where I take the same outfit and brighten it up gradually each step. While the last look isn’t blindingly colorful, it’s much more colorful in comparison to the outfit we started with. Summer’s also a great time get a bit more casual, especially if you’re a suit and tie kind of guy. You can use The Swap Trick for more than just color. Here, we’ll take an outfit from dressy to a bit more summer casual. 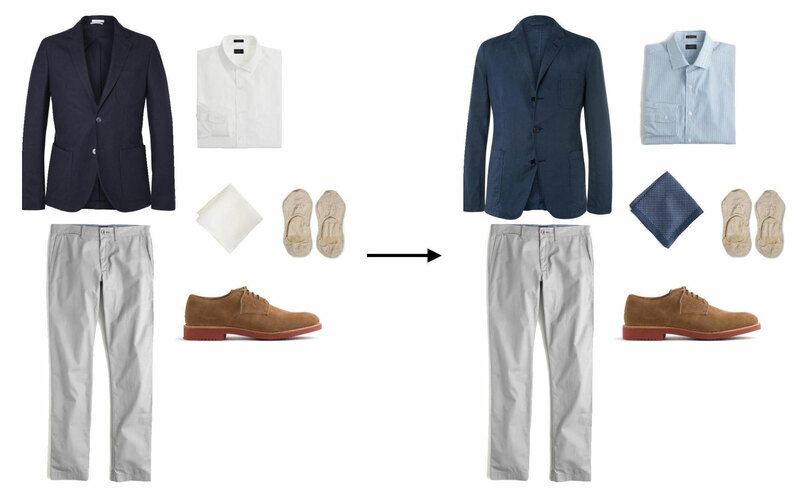 Swap out your wool suit for an unlined linen blazer and summerweight chinos, a lot more breathable than your fall suit. To keep even cooler, swap your calf length socks for invisible socks. Don’t make the mistake of going completely sockless, as this can lead to blisters and really smelly feet. When it comes to invisible socks, look for one that closely follows your shoe opening, like these low cut ones from Falke. As for color, match your socks to the color of your shoes for maximum stealth. Now let’s use what we learned in the first lesson about color and take this outfit to the next level. Start with neutral combinations of this outfit first, then use The Swap Trick to add swap a couple pieces for more colorful variations. You don’t have to go wild, simply brightening up the dark navy to lighter blue blazer and switching to a pale blue shirt does wonders. 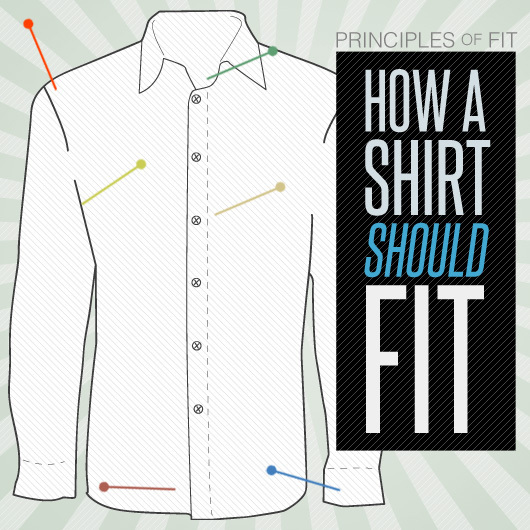 Loosening up the fit of your clothes will actually help you stay cooler, as your skin has some room to breathe and sweat. It also helps your style come off as effortless and relaxed. So how do you loosen up your fit without looking like a complete bum in oversized clothes? The trick is don’t go overboard by loosening the fit of your entire outfit. Instead, juxtapose. Pick either your tops or your bottoms to relax. Not both. In the spring and summer season, brands will release pieces with looser fits, often under the names “relaxed” or “oversized”. Keep an eye out for these, if not, you can simply size up. Just don’t go too far or you’ll be swimming in your clothes, and that’s never a good look. Want more ideas for the summer? 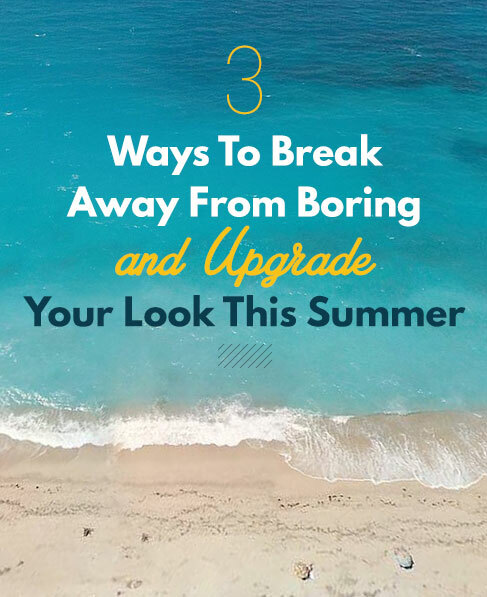 Check out my Essential Guide to Hot Weather Style, where I break down how to look amazing when the temperature rises. It features contributions from people like Megan of Style Girlfriend, Jian DeLeon formerly of GQ and Complex, and more! Who knew? If you want to wear more colors, try putting on a colorful shirt. Wow! So simple! Jokes aside, cmon. Where’s the value? 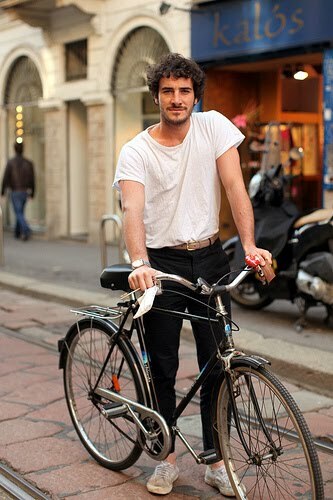 The guy with the bike looks like a bum. I would never try to emulate that ‘style’. Awesome to see that you had Peter guest as a writer. I’ve been following him for a while. Great pairing. great tips for my doesnt-know-what-to-wear husband. thanks!